Apart from unlimited 2d design ideas, Crystals 3D offers 3d models engraved in crystal. 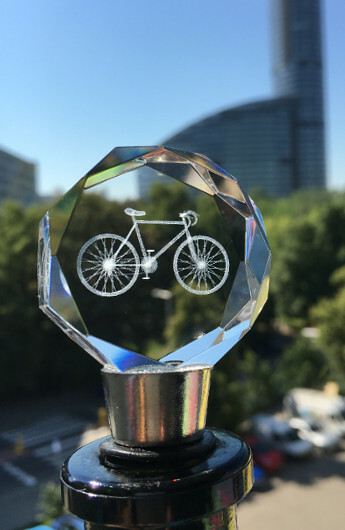 They can be used as crystal trophies, sports trophies (sport meetings, events) or as 3d engraved statuettes (conferences, festivals, concerts or as decoration). We custom all projects, what means each crystal will be engraved according to you expectations and based on provided graphic materials. We customize all 2d projects in crystals, that is why first of all we have to know your expectations: what occasion you are looking the crystal for, how many crystals you want to order and who you wish to give it to. Once we such details, our experts will come up with the best solutions that answer your needs. You can expect at least one proposal to be sent for your approval. In general, the whole project proces is for free. Sometimes, however, we need to price it (more about it in Price of 3d models section), but we will not charge you unless you accept the cost. Once all details are known, our graphic design team will start working on your project. They will be happy to advise all details. If needed, we also recommend to convert your logo from 2d to 3d format. After your approval we are ready to engrave your project. And this is how we deal with 3d glass trophies. Good display and proper illumination are very important factors, if you want to have your 3d crystal trophies or 2d pictures in crystal nicely seen. Engraver will not be clear, if the background is a white wall, it will not be seen in a dark room, either. The easiest way to solve the problem is a LED light base. Its dimensions depend on the crystal size and its weight. The LED illumination coming from under the crystal will make your engraved crystal shining and nicely exposed, even after dark or in a dark room. You can check our LED bases in LED BASES section. There are a couple of ways how to create and quote 3d models. As we want to meet your expectations, while creating a 3d picture, at the very beginning of our cooperation we need to know some details, e.g. what the event or occasion is you are looking the 3d crystal for, which 3d model you are interested in, if you want to have any text or logo added. a 3d model was never created (as it is a machine, a motor or any other object, belonging to your company or brand). This time we ask you to send us 2d pictures of your model (front, back, both sides, top and – ideally – bottom of it). When we get the pictures we are able to quote designing work to create an appropriate 3d model. We start modeling only if the price is accepted. And again, even in this case we will be able to use the created model in the future projects of yours. Where do 3d thophies are being made? We make all our crystals (3d laser engraved trophies and 2d pictures in crystal) in our studio in Wroclaw, Poland. But we are an on-line shop, what means that it is not important if you are located in New York, Barcelona or Tokyo - we treat all our clients fair and you are charged for our personalized 3d pictures equally in any country. If you want to get a 3d picture you have to send us your 2d picture by e-mail and we will quote conversion work. After such conversion you get a 3d picture engraved in glass (it looks like kind of a relief). We have to charge extra for such conversion and its price depends on your 2d picture and complexity of needed work. Is it possible to add 3d text to 2d project? Absolutely yes! Any 2d text can be converted into 3d text or 3d inscription. Such conversion is included in a crystal price, you do not have to pay extra for such service. However, anytime we prefer to advise if such conversion is a good idea (in your case) and if the final result is worth it. The net result depends on total volume of the text, a crystal size and dimensions and the whole project composition. All in all, you can count on our best advice on your project and its details. Can I add a 3d logo to my project? In general, any logo can be converted into 3d format. In most cases we can do it for free, however, we reserve the right to price the conversion of your 2d logo to 3d logo (if the work would be complex, or if you expect a relief result). In such case we quote it and wait for your approval, before we start working on such conversion.